Cross stitching is not only an expression of creativity, but also a hobby that feeds the soul with peace and quiet. 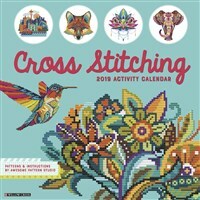 Celebrate the art of cross stitching as a time-honored craft in this calendar, complete with unique designs, patterns, and instructions. This large format wall calendar features grids with ample room for jotting notes. Also included are moon phases (CST), along with U.S. and international holidays.